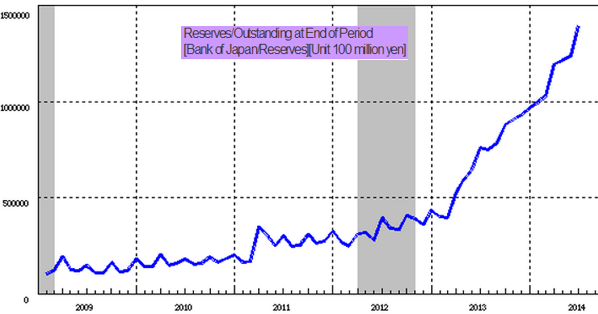 Many investors seem unaware of just how large Japan's QE program has been relative to other central banks. While the Fed, the ECB, and the BOE have roughly converged to the same level (as a proportion of their GDP), the Bank of Japan's balance sheet is more than double that of its counterparts abroad. The official goal of course is to stimulate credit growth to the private sector by lowering longer term rates and boosting excess reserves in the banking system. The 10-year Japanese government bonds now yield 0.57% and the reserves have indeed spiked. But while we've seen small improvements in bank lending, credit growth in Japan remains tepid. The primary reason for this trend has to do with the lack of demand for credit. Both households and companies are loathe to take on debt. One can't blame them of course - taking on fixed liabilities with looming risks of deflation is dangerous (imagine watching your assets depreciate, while liabilities remain fixed.) And as we saw in the US (see chart), other than during periods of frozen credit markets, quantitative easing has not been shown to be very effective in stimulating credit expansion. As a prerequisite to get people to borrow, one needs a stable inflation rate. And while the BOJ has achieved higher inflation, question linger about its stability. A great deal of the price increases has been achieved by weakening the yen (see post). The yen depreciation however has been halted, with USD/JPY exchange rate remaining remarkably stable. In order to have a sustainable inflation rate, Japan needs stable economic growth that supports wage increases. But economists continue to question the nation's ability to maintain momentum. CNBC: - "Economic activity has indeed picked up since the QE program began early last year, but there are now serious warning signs that this progress may not be maintained," Adam Slater, senior economist at Oxford Economics wrote in a report. In the short video below Takuji Okubo questions a number of assumptions regarding the economy and wages in Japan. All this will come to a head in October of this year, when growth and in particular the inflation rate will be benchmarked against the BOJ's target levels. If the projections are unsatisfactory, as some expect, the BOJ will be forced to accelerate the quantitative easing program. The already massive divergence between BOJ's balance sheet and that of the other major central banks will increase further.